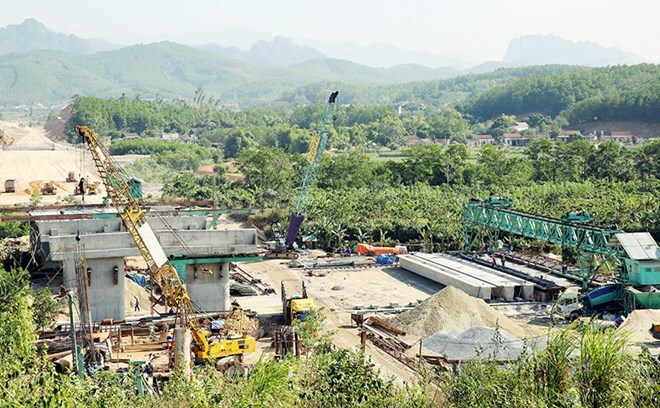 Quang Ninh (VNA) – The BOT Bien Cuong company, the investor of the Ha Long-Van Don Expressway in the northern coastal province of Quang Ninh, has committed to completing construction of bridges and road surfaces in November 2017 and put the road into operation in December. The Ha Long-Van Don Expressway includes two sections: the 53.6km Ha Long-Cam Hai expressway and the National Highway 18’s Ha Long-Mong Duong section with a length of 31.25km. It connects the Hanoi-Hai Phong-Quang Ninh economic triangle, boosting the development of Quang Ninh and the Northern Key Economic Region. To fulfil the target, the investors have kept close watch on contractors’ operation, while urging them to use more manpower and equipment to finish the road. Chairman of the Quang Ninh People’s Committee Nguyen Duc Long said that as the province considers the road a key project, it will create optimal conditions for investors and contractors, especially in land clearance.